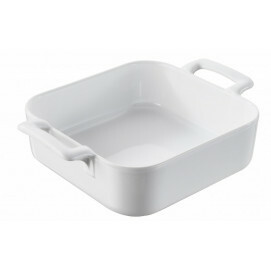 Square baking dishes are very handy when it comes to pastry: this baking dish, square, with two small handles for easy grip, will be the reason of success of all type of recipes, sweet or savory. Eating dessert for breakfast? Here is your ally! Les Naturels is a range of cake pans conceived to make all type of comfort food-family style recipes: make your best apple pie, brownie, crumbles and other savory casseroles and serve directly on the table! The dish works like a dream, is so easy to clean, goes from oven to table to the refrigerator, is totally eco-friendly and toxin-free, and it’s beautiful! Take a look at the rectangular baking pan of the same collection ! Sesame grey. Also available in cream.